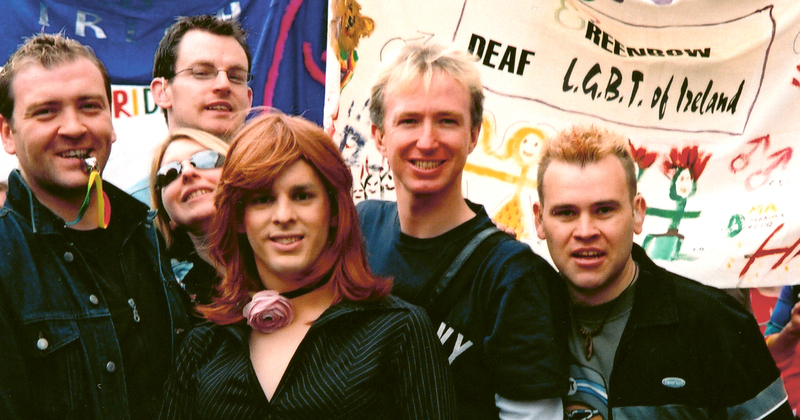 Established in 1996, Greenbow, the group for deaf LGBT+ people, is still going strong. Peter Dunne speaks to some of the members. Interviews 17 April, 2019 . Written by Peter Dunne . In recent issues of GCN, there’s been much talk about the issue of rural isolation in Ireland – of feeling you can’t access your community, of feeling apart. Meeting some of the committee members of Greenbow, they described another way to feel isolated from your community, even in a big city such as Dublin – when you are literally communicating in a different language. It’s a busy day in the Deaf Village in Cabra. There’s a group for seniors filling up the large space beside the reception area and the canteen is buzzing with people. Current Greenbow secretary, Leesa Brennan, meets me and brings me into a small office to meet Dominic McGreal and Connor Desmond. With no real knowledge of sign language – I know the alphabet and the odd word here and there but nowhere near enough to hold a conversation – Leesa interprets some of what the guys have to say. Already I realise how difficult it could be to communicate if we weren’t in a small room like this one which we have to ourselves. What if we were in a crowded nightclub? That exact example comes up later in our chat. Dominic has always been heavily involved in the deaf community. Having been the secretary for Greenbow for eight years, he’s also been working in DDA (Dublin Deaf Association) for the last seven. Dominic explained that Greenbow formed over 22 years ago with an aim to not only be a meeting group for deaf LGBT+ people, but also to campaign for their rights. Back then, the lack of sign language interpreters at events had a huge impact on the deaf community, after all, why attend something if you can’t understand it? Even on the odd chance an interpreter was provided, the logistics of then making sure the interpreter is also clearly visible then come into play. Dominic described how, many years ago, one Dublin Pride festival provided an interpreter for the main stage speeches. However, deaf attendees couldn’t gain access to the front of the crowd to actually be close enough to see the signing, making the whole thing a bit of an exercise in futility. After its formation, Greenbow began to address this problem by providing the now-defunct GLEN (Gay and Lesbian Equality Network) with interpreters for talks and events and also providing deaf awareness training. The group formed just a few years after decriminalisation, so for many there was still a fear of coming out. Greenbow was there to offer advice, information, and even help build up people’s confidence through social engagement and activities. As the group continues to move forward, Connor notes they are fighting for the rights of deaf LGBT+ people nationwide and not just confined to Dublin. Here again, rises the issue of rural isolation, but this time with an added obstacle. Dominic reiterates the difficulties for LGBT+ people living alone in remote areas. Local deaf clubs have sent LGBT+ members in Greenbow’s direction in the past, but there are also those who might not have access to such clubs, or even if they did, they might not feel comfortable talking about their sexuality within those clubs. While the group hold many events in Dublin, Leesa says it’s unfair to expect members to have to keep making the trip up to the capital, so they are also planning to arrange nights out in places such as Belfast, Cork and Galway. I ask if the hearing LGBT+ community are inclusive of deaf people. The answer, as with most things, is ‘it depends’. The lack of interpreters is the main thing. Leesa described buying tickets for a festival whose organisers contacted her the night before to say they wouldn’t have someone who could sign but they’d give her a seat at the front so she could try lip reading. Leesa decided not to attend. The thing about lip reading, Leesa explains, is people assume you are picking up 100% of the sentence. Leesa has some hearing, but even at that, with lip reading, you only get about 20% of what’s being said. As an example, she describes, “If you said to me – ‘I’m going to the shop to get a drink’, all I would catch would be ‘shop’ and ‘drink’ and then I try put the rest of the sentence together myself.” Something which never occurred to me, although it’s obvious once you think of it, is how accents can also affect lip reading, after all, not everyone pronounces their t-h’s when saying ‘thanks’. I ask if there’s a big difference between ISL and BSL (Irish, and British Sign Language) considering the hearing communities speak the same language. There can be quite a difference, I’m told, but with sign, it’s also about body language and facial expressions, and they are mainly similar. The language barrier also arises when well-meaning but unthinking hearing people ask a deaf person to ‘teach them sign language’. Leesa describes having to explain to people at work how it’s a whole language, “That’s like me having to teach you every word in French now. This story originally appeared on GCN’s April 2019 issue. Read the full issue here. 17 April, 2019 . Written by Peter Dunne .